It's Facebook Fridays! for September 7, 2018, and we want to help you hold on to your good, good loving! 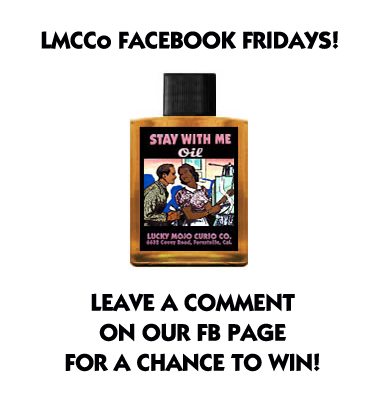 The Lucky Mojo Curio Company is hosting a random drawing to give away 8 bottles of hand-made Lucky Mojo brand Stay With Me Oil for fidelity, long-term bonding, and marital union. Put a drop behind each ear or dress a pink candle with the oil and put the power of this traditional herb-based formula in your service to keep close the one whom you love most dear. First thing tomorrow morning, we will select EIGHT winners at random, announce their names here, and ask them to message the Lucky Mojo Facebook Page with their mailing addresses, so we can send them their FREE Stay With Me Oil. Thanks for posting, Rev Ernest! We have a winner! In fact, we have 8 lucky winners! Our Facebook Fridays! winners for September 7, 2018 are: Mari Paniagua, Henderson Shantell, Rhonda Verma, Amy Griffith, Alyssa Lucille Long, Shannon Dubuc Noda, David Abad, and Laika Rae.